A while back (like a year), the boys at Neuros sent me a Neuos OSD unit to play with. They didn’t really ask me to do anything specific with it, but send it they did. When it came, I unboxed it, and promptly put off playing with it because I was too busy. I was also a bit dissapointed that it couldn’t output anything HD – having just put in my 720p projector, I just didn’t have a good place to test it. A couple days ago, I picked up a Sonic Impact ipod video dock for under $40 at Sams. I was trying to think of a good test config and remembered the Neuros. After I set up the Neuros on my network, it easily found my samba share of media. Playback was just a couple button pushes away on the remote – and it works very well. If you live by iTunes, by all means go for an apple TV. 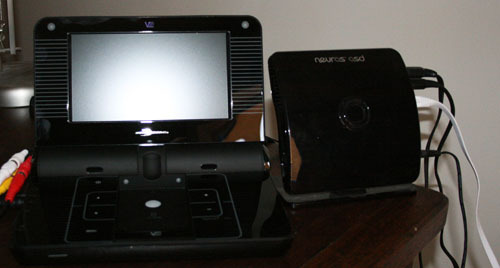 If you prefer to keep things a bit more portable, then check out the Neuros devices. They’re pretty cheap, they’re Open Source so you can hack away on em, they even have development bountys for features. Right now I’m thinking that a Neuros would make an excellent in car video player. Just store some moves on a big CF card or an external USB drive, hook up some power and you’ll have a hardware player that doesn’t make any sound, doesn’t look like a stealable iPod, and you can just hide it under a seat or in your dash.